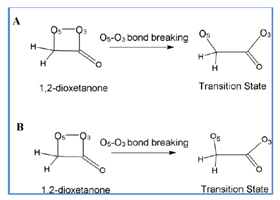 The peroxide bond breaking step of the decomposition reaction of dimethyl-1,2-dioxetanone was studied by using a density functional theory approach, in implicit dichloromethane. The calculations performed in this work revealed an interesting feature, the absence of a biradical intermediate, contrary to the expectations of some authors. However, this is in line with our previous study of the chemiluminescence of simple 1,2-dioxetanone and some experimental studies. The evidence for the absence of a biradical intermediate in the decomposition reaction of these molecules can also help to clarify the recent controversy regarding the chemiluminescence of simple 1,2-dioxetanone.